Once constructed, the Blessed Stanley Rother Shrine will be the largest Catholic church in Oklahoma, allowing for large diocesan events such as ordinations, the Rite of Election and high school graduations. The new facilities also will serve the growing Hispanic community. Masses at Sacred Heart, Saint James the Greater, Little Flower and other nearby parishes are overflowing. Masses at the Blessed Stanley Rother Shrine will help alleviate overcrowding and will be celebrated in both English and Spanish. Located near the crossroads of America, just south of Interestate 40 and I nterstate 35, the shrine will serve as a strong, visible and welcoming presence of the Catholic Church in Oklahoma. The campaign will add funds to the Catholic Foundation of Oklahoma’s Blessed Stanley Rother Endowment Fund to provide ongoing support for the maintenance and operations of the shrine and related ministries. Revenue generated from the endowment will supplement weekly offertory collections, gifts and purchases by shrine visitors. Standing as a beacon of faith and a visible sign of the Church’s presence in Oklahoma, the Blessed Stanley Rother Shrine Complex will be a resource for the whole archdiocese. It will welcome people from across central and western Oklahoma as well as visitors and pilgrims from around the world. The church at the Blessed Stanley Rother Shrine is designed in the Spanish mission style, echoing Blessed Stanley’s church in Santiago Atitlán. 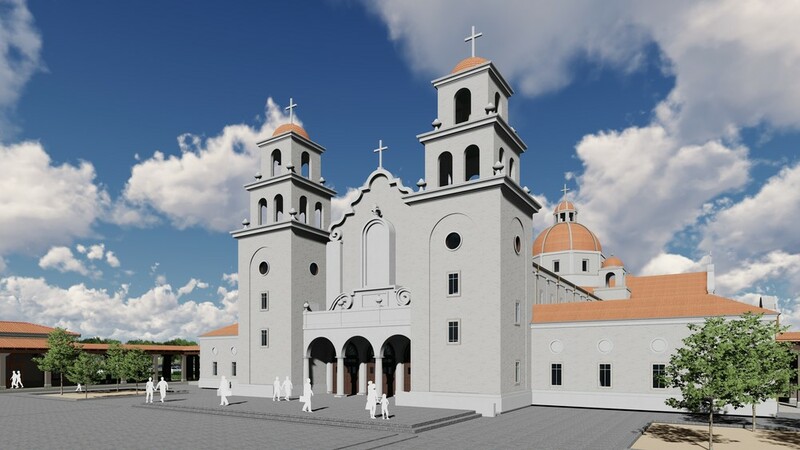 In addition to the church, the Shrine complex will feature a two-story ministry building to respond to the religious education needs of the growing Catholic Community. This building will provide much-needed classroom and gathering space, administrative offices, and an event hall to host large archdiocesan gatherings, receptions, and retreats for pilgrims visiting the Shrine. Above and beyond the archdiocesan campaign to build the Shrine church, chapel, and ministry facilities, we seek to build the Blessed Stanley Rother Museum and Pilgrim Center. Located on the campus of the Shrine, the goal of the museum is to tell the story of Blessed Stanley Rother’s life of missionary discipleship. The museum will serve as an archive for materials related to his life, martyrdom, and beatification. Perhaps, one day, it also will contain information related to his canonization. The Pilgrim Center will be the first arrival point upon reaching the Blessed Stanley Rother Shine and the pathway for pilgrims to reach the main church and chapel. Inside the 6,000 square-foot facility, pilgrims will find an orientation room with a video documentary, and the museum will feature artifacts from every stage of his life. Give a Gift to Support the Bl. Stanley Rother Shrine!